The standard model, the Leica DISTO™ A5 now available from Merlin Lazer Ltd is convincing not only by its ergonomical shape and the pleasant Softgrip. 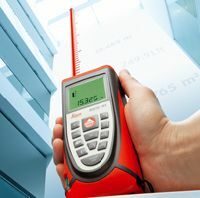 The inventor of hand laser measuring instruments is now introducing the Leica DISTO™ A5, a very handy and easy to use instrument to the market. Due to the new Power Range Technology™, measurements up to 100m without any target plate are now possible. Precise and within seconds, the Leica DISTO™ A5 measures with an accuracy of ± 2 mm. The unique multi-functional end piece can be unfolded and the built-in sensor automatically recognizes the correct reference. Stable measurements from edges or corners are made easier than ever before. The built-in telescopic viewer features 2-fold magnification, making the Leica DISTO™ A5 a reliable partner when measuring long distances. Combined with indirect height and distance measurements, it is the ideal measuring instrument - even outdoors. Of course, the most frequently used calculation function can be called up fast and easily. At a press on the button makes the following room calculation functions available: room circumference, wall and ceiling areas. At the same time, Leica Geosystems is bringing the Leica DISTO™ A3 to the market. It is even smaller and handier than its big brother, but looses nothing in its handling. Together with the top-model, the Leica DISTO™ plus, we can now provide you with the right instrument for every area of application. Whether you "only“ want to make a simple distance measurement or whether you want to transfer measured data wirelessly to a PC for further processing - the Leica DISTO™-family provides the perfect solution. Due to the high quality and reliability, Leica Geosystems grants a two year warranty on Leica DISTOs™. With these innovative hand laser-measuring instruments, Leica Geosystems in conjunction with Merlin Lazer Ltd will consolidate and further expand their position as market leaders.